Warning, I will state that I have not read the Ranger's Apprentice series. 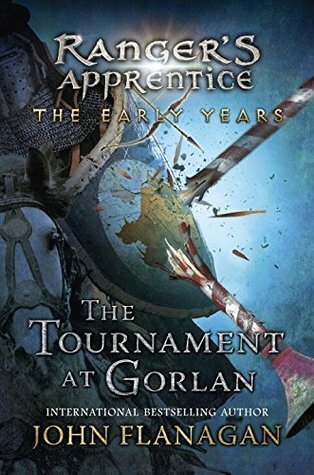 I know that even though this is considered the first book in a series it does spin off of the Ranger's Apprentice. I have always wanted to pick up that series just haven't so far and when I saw this one coming out I thought I would try to it just to make sure I like the author's writing style or what not. Now I did read a couple of reviews about how this book was about Halt and Crowley which many people loved in the Ranger's Apprentice series and I found out even without knowing these characters from the previous series I found I grew fond of their witty banter as well. The book wasn't all that confusing I mean yea I guess I don't really know who Morgarath is but I got a pretty good idea by the end of the book. This is supposed to be kind of a prequel to the Ranger's Apprentice so it wasn't all that confusing for reading wise. I am excited to start the that series though now because of this book. I think my favorite part in the book is when Halt gets a new horse named Abelard.This scene was hilarious because Ranger's horses can't be stolen but Halt doesn't ask the important questions when coming to try to ride Abelard. I knew when the horse master said that the horses can't be stolen that Halt should take a step back but he didn't. Then he was part of a bucking bronco ride. I liked the story line and the characters but the only thing I didn't really appreciate was that it was a total sausage fest. There was one lady that was sort of on the outskirts towards the end of the book that liked Halt and helped them, but other than that no women were really mentioned. I dunno if this is how all the books by this author are going to be like but I can if it is I can see that as being a reason for me not continuing the series right away. Other than that I like the style of writing and hope to read about Crowley and Halt in the other books and do wish to continue and even start the Ranger's Apprentice series, I am glad I picked up this book to see if I should give it a try.